I love winter. I love imagining I'm somewhere dark and cold and old, like Sweden or Norway or Denmark. 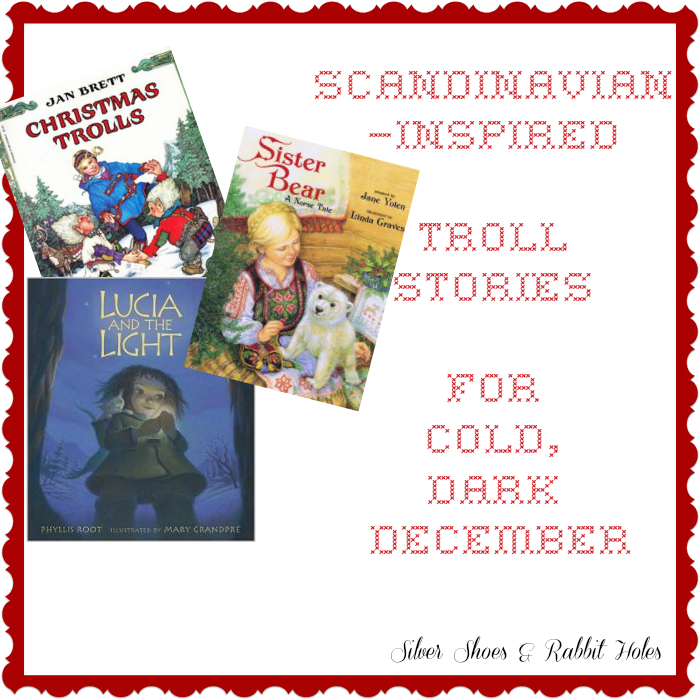 I'll have a final big post up later this St. Lucia Day, but I wanted to share some beautiful picture books with a Scandinavian flair. Let's start with Jan Brett, shall we? I love Jan Brett's winter stories. The cozy colors are so vibrant again her snowy backdrops. 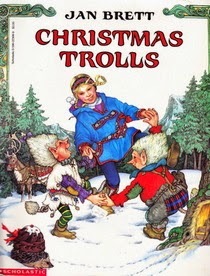 Christmas Trolls is about a little girl named Treva, and what happens when the family's decorations go missing. Turns out, there are a couple of naughty little trolls, who do not understand what Christmas is about. Treva takes the time to teach them about kindness and getting along, as she helps them decorate their own tree. Who's That Knocking on Christmas Eve? by Jan Brett. Who's That Knocking on Christmas Eve? 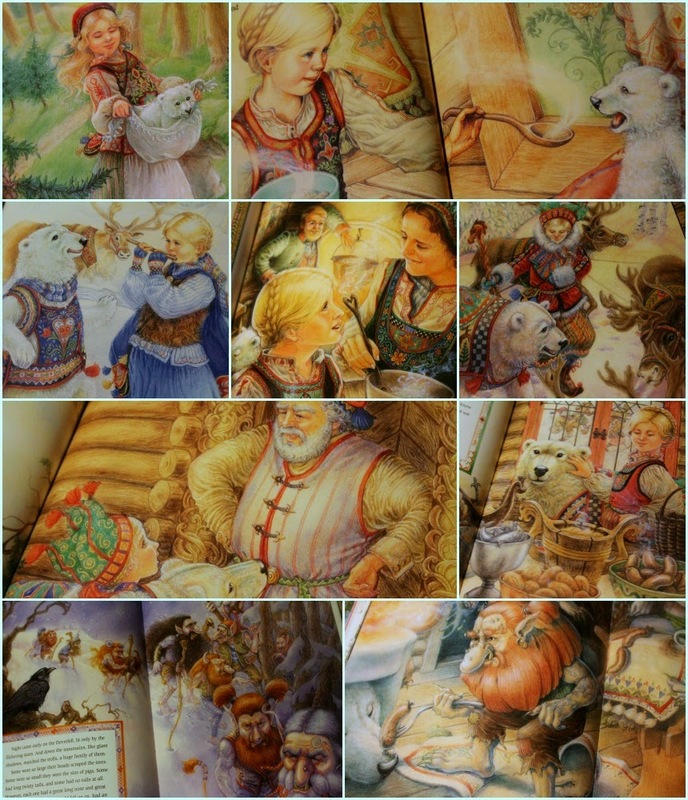 is based on an Norwegian folktale. 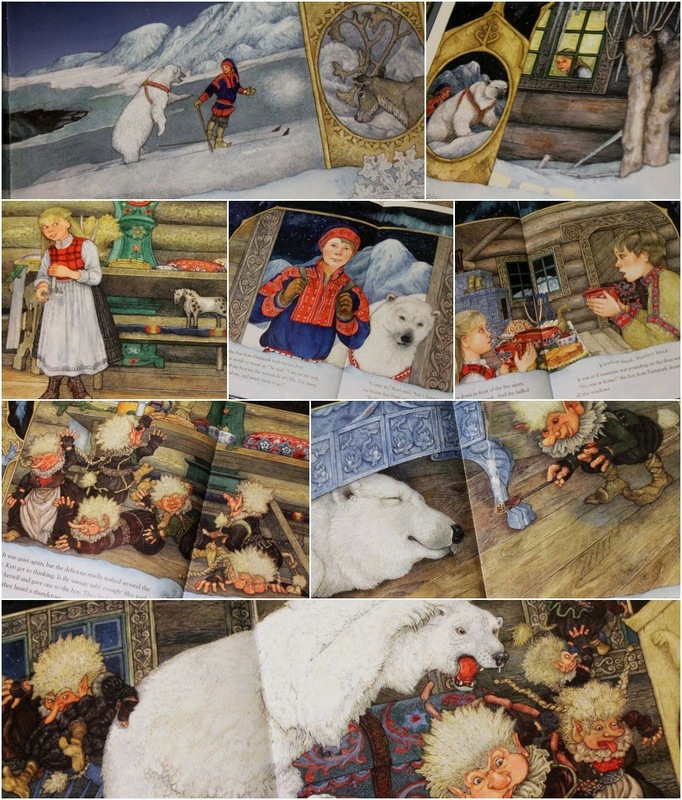 In Brett's book, a boy and his pet polar bear are traveling from Finnmark to Oslo. They stop at a cabin to ask for food and shelter for the night. At a cabin, a girl's father sets out on Christmas Eve, leaving her to prepare the house for the inevitable invasion by trolls. The boy and the bear beat the trolls to the house, and hide as they burst in from the cellar. A troll mistakes the slumbering bear for a kitty, offering it sausage. The bear rears up and roars, frightening the trolls away. The girl's father rushes back. He tells the boy from Finnmark he and his bear are welcome any time. One day, the girl runs into the troll who tried to feed the bear. He asks if she still has her pet cat. She tells him, yes, and she has kittens now, even bigger than she. The troll cowers and says they will never visit her house again. 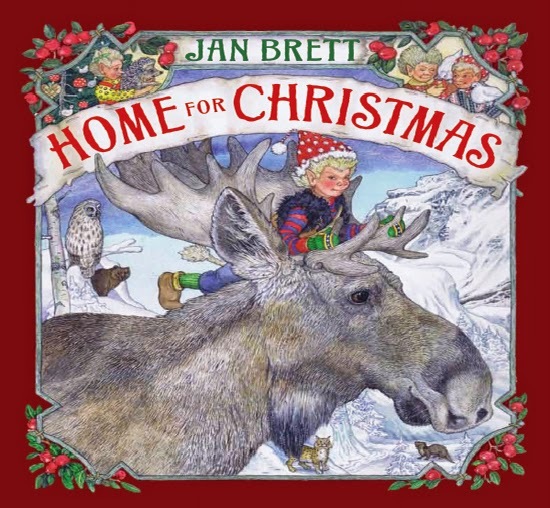 Home for Christmas by Jan Brett. G.P. Putnam's Sons for Young Readers, 2011. In Home for Christmas, a little troll named Rollo doesn't want to do his chores. He runs away, looking for a new family to join. He tries to join several different animal families: owls, bears, otters, moose. Eventually, though, he realizes he misses his own family, and rushes home in time for Christmas. Now, here are a couple of books that are not by Jan Brett. This one, however, has a familiar storyline! 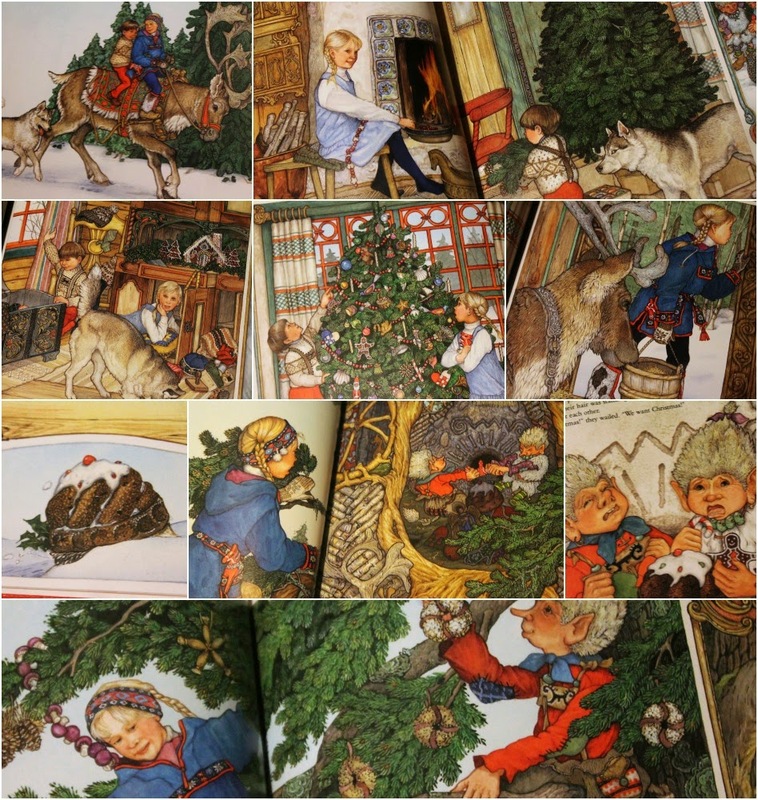 This warm, lushly illustrated book is based on the same folktale as Who's That Knocking on Christmas Eve?. The twist is that the bear and its companion are both female. Halva found the bear as a cub in the woods, and raised her to adulthood. 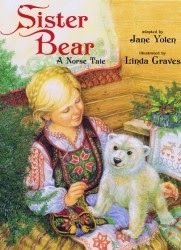 She has taught the loyal animal to dance, and the family decides she should take the bear to Oslo to dance for the king. 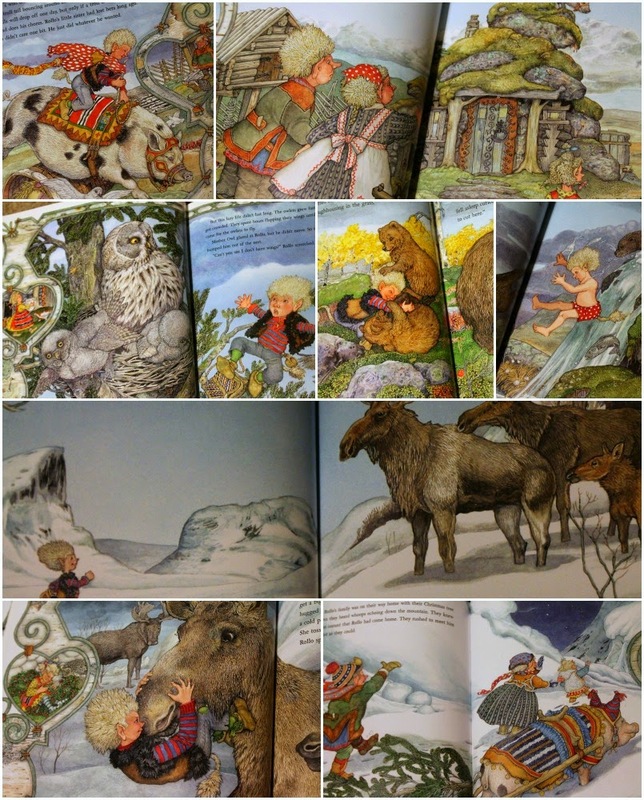 Traveling from Finnmark, Halva and the bear stop at a cottage for the night, but the owner tells her everyone is abandoning the building for it is Christmas Eve, and the trolls come every Christmas Eve to eat their fill and trash the place. Halva is not concerned. Everyone leaves. She and the bear eat a bit, then hide when they hear the trolls. Once again, a small, nearsighted troll mistakes the bear for a cat, and again, the bear rears up and roars, frightening away the trolls. Halva tidies things up, and the owner is so pleased the next day, he invites Halva and her family to spend every Christmas with them. When Halva runs into the troll again, she tells them that yes, she and her cat will be back next Christmas, and they will bring the cat's much larger kittens with them, too. This lovely book is a bit different in that it is not a Christmas book, but it is one about winter. This Lucia is not the saint, but a little girl living with her mother and baby brother, high in the mountains. All is well until the sun disappears. The darkness changes their previously happy lives. One night, Lucia cannot stand it any longer. She bids a silent goodbye to her family animals, and sets off to find the sun. She will climb high up the mountains. The cat steals away with her. At one point, she almost falls asleep in the snow, but the cat saves her. As she reaches the top, she finds trolls! They claim they have stolen the sun, so they can be out and about forever. They show her how they've wrapped it up in a ball of rags. As Lucia distracts them with her tinderbox, the cat bats away the rag ball, which unfurls. Suddenly, the sun is blazing in the sky, and the trolls are turned to stone. 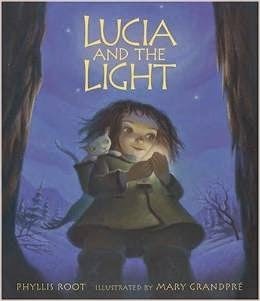 Lucia and the cat return home, where her mother is waiting. She tells her daughter how scared and sad she was, until the sun came out. That's when she knew Lucia had succeeded in her quest. 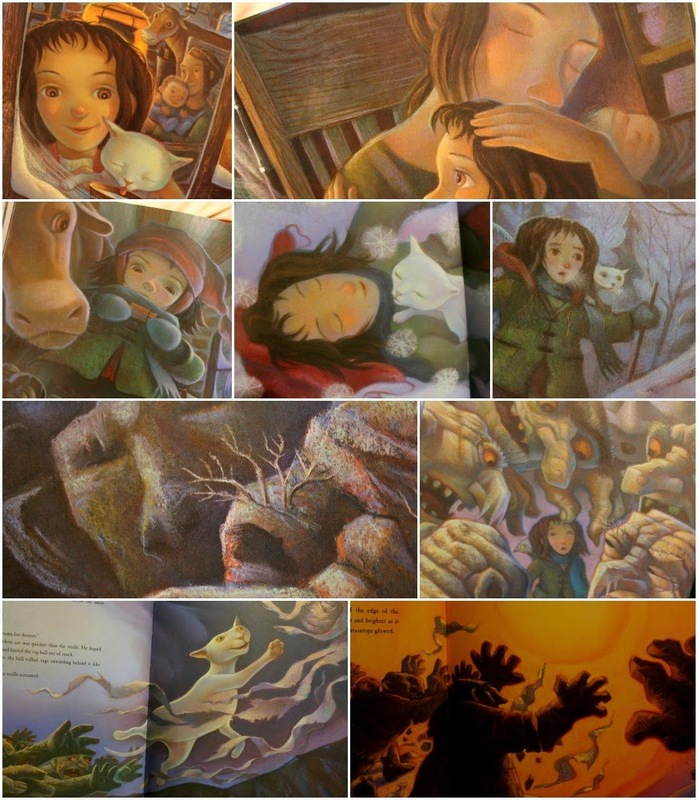 The illustrations, by Mary GrandPré of Harry Potter fame, are beautiful. Our copy from the library was a handsome one. Sadly, it seems to be out of print. I'll share our St. Lucia Day morning with you later today! I'm obsessed with all things Scandinavian. Beautiful books! 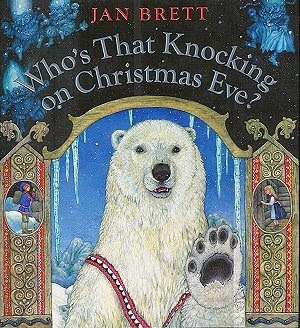 I have Home for Christmas among our Advent books too, Jan Brett is amazing. Great post!! She's awesome. Her website is full of freebies, too - printables, coloring pages, games. She's very generous! A BIG GIANT YES. to all of it. 100%. lovely!! !